The elegant shade design of this contemporary pendant light promises to catch the eye and provide warm, modern lighting. Enhance a contemporary style living space with the fashion-forward style of this brushed nickel pendant light. The white shade design has the look of a beautiful flower cloud from below. 22 1/2" wide x 11" high. Canopy is 4 3/4" wide x 1" high. Weighs 4.84 lbs. 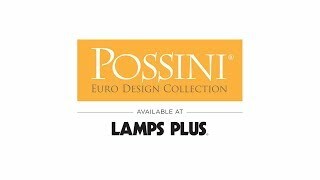 Contemporary style pendant light from Possini Euro Design®. 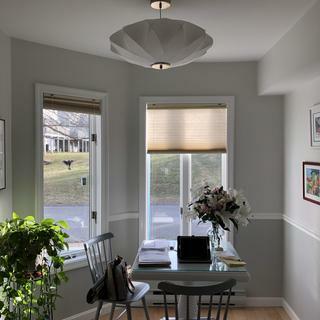 Saucer shade inspired by Mid-Century designs. Brushed nickel finish accents and canopy. White saucer shape in poly-resin. Love the design. I think it will be beautiful over my table! Elegant yet understated modern design. It will be absolutely beautiful in our new kitchen! Clean lines in the kitchen, and clean lines on this light. All good! Does this light come in 277vac? BEST ANSWER: Hi – the light operates off of 110-120V AC. There are no other options offered. How do you keep it clean, dust free? BEST ANSWER: I haven't had my light up very long so it getting dusty hasn't been an issue yet. What I plan on doing is using a Dust Buster Hand Vacumn on it, along with a soft bristle brush. I think the only concern with it would be where you plan on hanging it. I think you would want to avoid areas where grease might settle on it. I hung mine over a craft table and I love it. To keep this fun light dust-free, I just use a swifter duster with a light touch. Can this be hung from a slope ceiling? 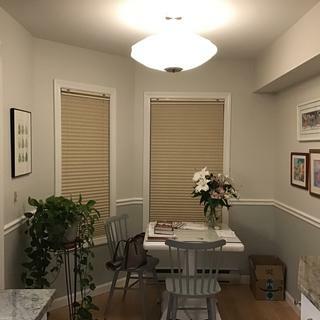 BEST ANSWER: We hung this exact lamp from a slope ceiling for our dining room. 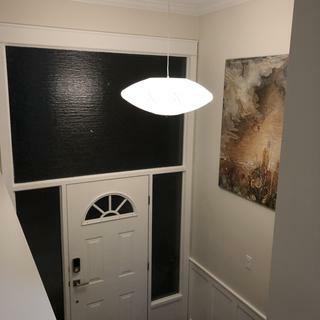 There was extra electrical cord exposed because of the slope, so be sure to ask your electrican to fish the excess cord through the ceiling so everything is hidden. It looks great! Yes. I just hung mine from my sloped ceiling. Looks fantastic. Love this light. How long is the cord? Can it be hung as a bedside lamp? BEST ANSWER: This includes 10 feet of adjustable cord. Sure, it can be hung as a bedside lamp as well. Yes. 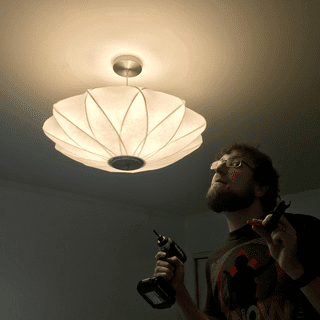 You’ll probably want to use bulbs that don’t produce a lot of heat, so LEDs are good. is the light sufficient for a bedroom? Can you swag mount this fixture? BEST ANSWER: You could "swag" mount it yes, but it is not really designed for that. The cord is certainly long enough. Further, you'd have to wrap the cord around the hook twice to get it to hold. can this be modified to include dark bronze or other dark metal instead of nickel? since this is not made of cloth but rather polyresin which I believe is a type of plastic, will it yellow with age? BEST ANSWER: No, it will not yellow because it is UV stabilized. Could you please describe the color of the shade and what poly-resin is? Also, what is inside the shade (looks like stretcher lines)? BEST ANSWER: Polyresin is a resin compound generally used for statues, figurines, bobbleheads and decorative furniture. It is a sturdy material that can be intricately molded, allowing a great level of detail with consistent texture. The inside lines is a metal frame. It is a beautiful fixture. 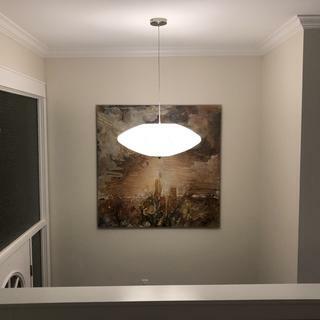 Can this hang on a sloped ceiling? BEST ANSWER: Yes, it attaches to a sloped ceiling without any problem. We LOVE the Flower Cloud. No, but because our ceiling can't have a hole cut into it for the electrical box (wood ceiling with roofing directly on top), we have an electrical box under the canopy that sticks out ever so slightly (1/2 inch). The light is so high on the ceiling that no one can tell. is the fabric shade cleanable? What if dust doesn't vacuum off? BEST ANSWER: Vacuuming the shade works well. Cleaning it with a damp cloth works as well. You can also use Dry Fabric Shade Cleaner sponges found at most local hardware stores. I have had mine up for 6 months and little dust has accumulated. The fabric appears to be able to be dusted or vacuumed. P.S. I like the light! I would not use a vacuum. Use a brush or a used dryer cloth. Yes with a damp clean cloth like you would on a lamp shade. Fixture is very nice statement piece. The recommended bulb is not really bright enough to shed any real light. I would recommend ANY bulb you use be an LED as you can have something a bit brighter, but more importantly, any incandescent bulb will leave discoloration over time. Love our new Flower Cloud! 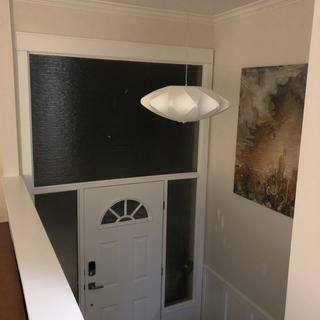 We bought numerous light fixtures for our new home, of varying prices. The Flower Cloud is a fantastic value for your money - it looks incredibly high end and elegant, and doesn't cost a fortune! We love it. Beautiful light. Looks elegant over my kitchen table. Absolutely lovely shade. Perfect for our Mid Century Modern themed Dining Room. We have already had many compliments on it. Extremely happy with our purchase. I love the size and style of this lamp. It brings a very elegant look to my piano room! This fixture looks great in our kitchen. High quality materials. Extravagantly decorativethis white gold scroll foyer pendant has an open-sphere framework embellished with faceted clear crystals.